Producer: Bender, Dr. David A. Traditional laboratory classes in biochemistry frequently fail in two of their major objectives: providing data for interpretation, because the students’ results are too scattered to be amenable to useful interpretation; and providing experience in planning and designing experiments, because of the constraints of class time. The programs are intended to supplement or replace laboratory classes, although of course for those who intend to progress to careers in experimental science real hands-on work is essential. There are relatively extensive screens to explain the theory at each stage of the simulation exercises, and you may find these programs useful for students to use for self-paced learning to ensure that they understand the topics, as well as part of a formal practical class. Specimen class worksheets for each simulation are included. 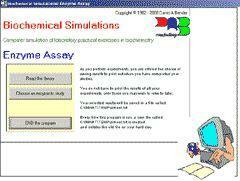 There are 5 simulation exercises availible: Enzyme assay, Urea synthesis in liver cells, Peptide sequence, Oxygen electrode studies, and Radio-immunoassay of oestradiol. The software is also available on CD.